Despite the long history of mysticism within Christianity, more and more Christians are turning to Eastern religions for spiritual guidance. Some have abandoned the religion of their childhood, believing they've found the "pearl of great price" in Eastern meditation. 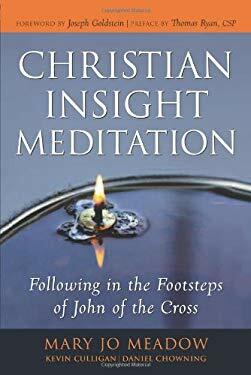 Christian insight meditation places Buddhist meditation within the Christian prayer tradition, guiding followers through a process of inner purification that leads to a deeper Christian faith and to the direct vision of God. Also drawing onthe teaching of Teresa of Avila, this inspiring book offers reliable guidance in learning the practice, allowing readers to follow in the footsteps of John of the Cross, while answering questions they may have about Christian grace and the Buddhist dhamma; karma, rebirth, and purgatory; and the Buddhist no-self and Christian soul. Readers will discover the power of Christian insight meditation to bring inner peace and healing and to deepen and enhance their Christian life.